A: Never before in the history of this column has there been a question that made me feel like I was about to write an essay for a fifth-grade civics lesson. Level with me here, Crook: If I do really well on this week's column, is there a chance I could win a competition and get to meet the Superman Emergency Squad? Even if I don't have the chance to get a selfie with Van-Zee, though, Kandor makes for a pretty interesting topic. It's one of the only elements of superhero comics I can think of that's interesting and distracting, a source of fun adventure and a constant reminder of failure, a plot point that a universe had to get rid of, and that everyone seemed to want to bring back as soon as they could, all in equal measure. In other words, well, it's complicated. Historically speaking, Kandor is hugely important --- so much so that its first appearance in 1958's Action Comics #242 is one of the first major Silver Age Superman stories. It's not the first - as Tom Peyer helpfully pointed out on Twitter, DC's official starting point for Silver Age Superman was in the previous month's Action #241 and the introduction of the Fortress of Solitude, but it does represent a seismic shift in how that character's entire world was structured. The Fortress may have given him a home that was as grand as Superman himself would grow during the era, but Kandor was a literal piece of Krypton with seven million Kryptonians into a world where Superman had previously --- and famously --- been that planet's sole survivor. There had, of course, been a few other elements that indicated that Krypton's destruction wasn't as thorough as we'd previously been led to believe, but before Kandor showed up, that had mostly been limited to Krypto the Super-Dog. Everything else --- Supergirl, the Phantom Zone Criminals --- would show up later. And really, while there's a lot of room for argument when it comes to whether Kandor was a good thing, I think we can all agree that a tiny little city full of tiny little Supermans is a little different than a flying dog with heat vision, even if they're both equally weird to have hanging around your Arctic fortress. Point being, it changes the narrative. Spinoff characters were inevitable --- Superboy was already a smashing success, the Legion of Super-Heroes had just made their first appearance, Jimmy Olsen had been holding down his own title since 1954, and Lois Lane had just started earlier that year --- but by introducing the idea that there could be other Kryptonians, it completely changes how you can approach the original. The idea that Otto Binder and Al Plastino put into play here was that Superman didn't necessarily have to be the last Kryptonian, as long as he was the only one who was Superman. You can see it in the way that the next few additions to the cast would play out. Supergirl's differences are obvious, but there's also the original hook of being Superman's "secret weapon" (conveniently stashed in an orphanage as Linda Lee so as not to cramp Clark Kent's bachelor lifestyle), which meant that she had to keep not just her identity a secret, but her existence, too. The Phantom Zone Criminals were, you know, criminals, and since they were mostly confined to hovering around in a tortured, bodiless existence, watching Superman every moment of every day, they didn't really dilute things too much either. Even Dev-Em, the juvenile delinquent who survived Krypton's explosion by being the only person on the entire planet to take Jor-El's warnings seriously, managed to set himself apart by hightailing it out of the 20th century as soon as he could. And Mon-El, well, he's not even a Kryptonian, despite being a character who was pretty much created to be a stand-in for Superboy right down to just flipping around the red and blue parts of his costume. He's a Daxamite, you see. Totally different thing. With Kandor, though, it's a little different, largely --- well, microscopically, I suppose --- because it's an entire city of Kryptonians. That means that it's not just different in and of itself, but that it can become an entirely different setting for Superman's adventures. If Superman's adventures around Metropolis ever get boring, then you can just drop him into the Bottle City for an adventure. There are even stories where Superman adds a third identity to his already complicated life, Nightwing, and functions as a sci-fi Batman in a way that actually tends to work a whole lot better than the sci-fi stories that are actually about Batman. From there, it just keeps adding more to the mythos, building to things like the Emergency Squad, and the associated idea that there are exact doubles for Superman's entire supporting cast just hanging around down there in case a situation ever arises where you'd need a microscopic super-powered Jimmy Olsen. And honestly? The idea that there's an entire group of tiny, tiny Supermans that can pop up at any time is something that I can never really dislike. But there's also a problem that's inherent in how Kandor works that goes beyond just the idea of whether or not Superman should be the Last Son of Krypton™. If it's going to stick around and be a permanent addition to the Superman Mythos, then it can never really be fixed. Adding a bunch of tiny Kryptonians might not distract from what makes Superman unique, but the moment everything gets fixed, you have millions of Kryptonians running around with those same powers and that same alien heritage, and that's definitely going to do the job. So since Kandor can never be fixed, that means that Superman himself can't fix it, and that in turn means that the Bottle City of Kandor becomes a very tangible reminder of Superman's greatest failure. It's a little depressing, and it only gets worse because of how prominent the Bottle City is at the fortress. Not to filter everything through the lens of Batman --- more than I usually do, anyway --- but Kandor somehow ended up being one of the only consistent visual signifiers for the Fortress of Solitude, in the same way that the Batcave always has the T-Rex, the Giant Penny and the oversized Joker card. The difference, though, is that while those are trophies that represent Batman's victories, Kandor is full of people who are just killing time until Superman finally got around to saving them. It's worth noting, of course, that Superman eventually did just that. After 21 years, Kandor was finally returned to its full size and stashed on a far-off planet where it would only interfere with the ongoing story if the plot required it. But again, there are a couple of problems with this. 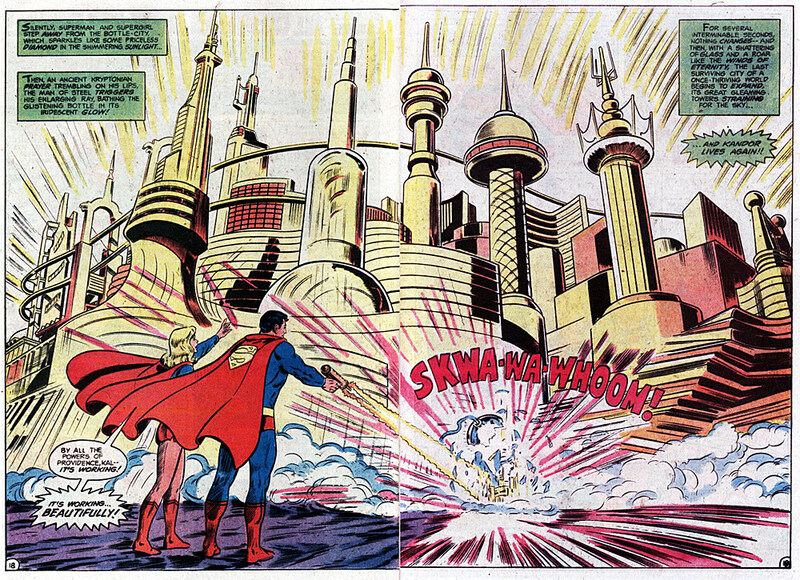 For one thing, they end up on a "New Krypton" that orbits a red sun, leaving them without Superman's powers in a way that, at worst, kind of makes it seem like Superman wants to keep all the heat vision and super-strength to himself, and at best just seems like the creators behind that story (Len Wein and Curt Swan, specifically) were admitting that having to write around the existence of a couple million Supermans was a hassle they weren't really interested in dealing with. And just to make things even weirder, it was only a couple of years later that an entirely new bunch of tiny aliens moved into Superman's (apparently fully functional) replica of Kandor and decided that it was cozy enough to call home. And really, if you're going to have a bunch of aliens living in the Bottle City of Kandor anyway, why would you bother getting rid of the Kryptonians in the first place? Looking at it like that, it's no wonder that it was one of the things that John Byrne got rid of when Superman was rebooted in the wake of Crisis on Infinite Earths. One of the stated goals of that whole experiment was, after all, to restore some of Superman's uniqueness, to make him the true sole survivor of Krypton. It will not surprise you to learn that it was only about a year and a half until Supergirl and the Phantom Zone Criminals showed up to put the first nail into that particular coffin, but to be fair, they were from an alternate dimension. But while ditching Kandor entirely might've taken the sword to that particular Gordian knot, it's hard to argue that it was the right move --- which is probably why it always found its way back onto one of Superman's Arctic bookshelves. As much as I'm attracted to the idea of Superman as the Last Son of Krypton™, and as much as I think that he should be unique within the DC Universe, all of the things that supposedly detract from that are really, really good ideas. Supergirl's great. The Phantom Zone is great. Krypto? The dog who can fly and has a little doghouse in space? He's great. As much as I feel like there's a lot of damage to be done with a fixation on Krypton, and as much as the idea of looking backwards to the planet where he was born pulls focus away from the heart of Superman and the idea that Earth is his home, there's so much of Kandor that works. It can be the place where he finds out about Krypton, cutting out the need for Jor-El's ghostly floating head; it can be the backdrop for a strange and compelling adventure that literally takes things to a completely different scale; and I genuinely think that there's a way to approach it so that it serves less as a reminder of failure and more as the reason that we need Superman to continue his never-ending battle. Plus, tiny Supermen who have nothing better to do than help Jimmy Olsen finish his writing. Seriously, if anyone knows what Van-Zee's transcription rates are, I am very interested.